Gujarat high court issued an official notification in which they are inviting all Indian eligible candidates for filling up the vacant positions of Stenographers. 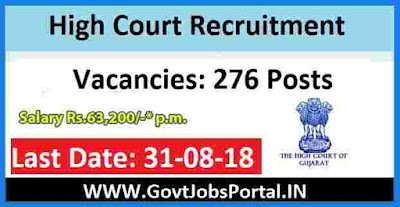 High court launched a notification in which they said that there are total 276 vacant positions which they want to filling up through this High court recruitment process. More information related to this Gujarat high court recruitment is given below in this article. Read the whole article carefully before applying online. We try to explain each and every prospective related to this high court recruitment in the given post below. We took this information from the official pdf file and we also share the link of that file under IMPORTANT LINK section in the end of this post. Candidates have a graduation degree in any stream and good speed in English Short Hand 100 w.p.m. Applicants who are wishing to apply these Gujarat High court recruitment must have age in between 21 to 35 years. Applicants having Graduation degree and good speed of typing in shorthand. Short Hand speed 75 w.p.m. in Gujarati language. What are the various application Fee for applying? Paying Method: Applicants who are eligible and want to apply have to pay the above application fee through the following methods: “ Online Payment (or) Cash-Challan(Offline)” . Candidates can use both methods of payment. What is the Process for Applying this Gujarat High Court Recruitment? Candidates have to apply online for this High court recruitment process. The link for applying online for these Government jobs for stenographer will be activated on 16th of August 2018. So you can apply online with the official website after this date. There is no other way for applying these Government jobs in India. Follow the IMPORTANT LINK section for the reference Links from which we took this information as well as for the online application form. (a) Applicants should not contact directly to the High Court Registry by the following methods of Phone calls/Personal Visits, for making general queries related to this High Court recruitment process. For any information related to this high court recruitment candidates have to keep checking the High Court-OJAS official Websites for various updates, and/or 'Brief Advertisement'/SMS Alerts on their registered Mobile/Cell Number. No Phone Calls or Personal Visits, shall be entertained by the high court. (b) Benefit(s) of Relaxation in Upper Age Limit / Examination Fees / Reservation shall be granted to the Candidates belonging to Reserved Categories i.e. SC / ST / SEBC / PH (only Orthopedically Disabled) / Women / Ex-Servicemen, provided that requisite Certificate in respect thereof, as the case may be, issued by the Competent Authority, is produced by the Applicant as and when called for. (c) A Candidate will have to opt for Three Districts, of his/her choice, indicating the superiority of their favorites, for being selected to the post in question and the Fourth District will be determined by the High Court, depending upon the availability of vacancies against the relevant category of that particular post, in accordance with the merit. (d) The Applicant who has successfully submitted their online application from, are eligible to appear at the Written Test, subject to their qualifying therefor. (e) The list of qualified applicants will be placed on official website of High Court as well as on HC-OJAS Portal, at the relevant time. 16th Aug. 2018 is the Opening Date to apply. 31st Aug. 2018 is the Last Date to apply online.